Experimental evidence suggests that matrix metalloproteinase-13 (MMP-13) protein may promote breast tumor progression, however, its role is yet to be fully established. Furthermore, it is not clear whether MMP-13 can be used as an independent breast cancer biomarker. This study was conducted to assess the expression profile of MMP-13 protein in invasive breast carcinomas to determine its diagnostic and prognostic significance, as well as its correlation with other biomarkers including estrogen receptor (ER), progesterone receptor (PR), Her-2/neu, MMP-2, MMP-9, tissue inhibitor of MMP-1 and -2 (TIMP-1 and TIMP-2). Immunohistochemistry (IHC) was performed on paraffin-embedded tissue microarray specimens from 263 breast carcinomas. The intensity and the extent of IHC were scored by pathologists. The correlation of the gene expression profiles with the patients' clinicopathological features and clinical outcomes were analyzed for statistical significance. MMP-13 protein was detected in the cytoplasm of malignant cells and peritumoral stromal cells. MMP-13 expression by tumor cells (p < 0.001) and stromal fibroblasts (p < 0.001) both correlated with carcinoma infiltration of lymph nodes. MMP-13 also correlated with the expression of Her-2/neu (p = 0.015) and TIMP-1 (p < 0.010), respectively in tumor cells. Tumor-derived, but not stromal fibroblast-derived, MMP-13 correlated with aggressive tumor phenotypes. Moreover, high levels of MMP-13 expression were associated with decreased overall survival. In parallel, the prognostic value of MMP-13 expressed by peritumoral fibroblasts seems less significant. Our data suggest that lymph node status, tumor size, Her-2/neu expression, TIMP-1 and MMP-13 expression in cancer cells are independent prognostic factors. Tumor-derived, but not stromal fibroblast-derived, MMP-13 correlated with aggressive tumor phenotypes, and inversely correlated with overall survival of breast cancer patients. MMP-13 may serve as an independent prognostic factor for invasive breast cancer patients. MMP-13 may be particularly useful as a prognostic marker when evaluated along with Her-2/neu and lymph node status. Breast cancer is one of the leading causes of cancer death among women worldwide. The increase in incidence and mortality rates of breast cancer in China over the last couple of decades is particularly significant . Clinical parameters, such as the size of the primary tumor, the histological grade, and regional lymph node involvement, are generally useful for prognosis prediction. However, the profile of molecular markers may provide valuable insights into the underlying mechanisms of disease progression, thus aiding the intervention strategies. In light of the racial disparities of breast cancer incidences and prognoses documented in the literature, it is important to identify and validate specific biomarkers for Chinese breast cancer patients. To this end, estrogen receptor (ER)/progesterone receptor (PR), and oncogene Her-2/neu have been shown to be useful markers of breast cancer [2, 3]. Breast cancer mortality derives overwhelmingly from invasion and metastasis, a process that requires continuous and extensive remodeling of tumor stroma. Epithelial basement membrane and extracellular matrix (ECM) are composed of tough network of fibrillar ECM proteins that can be directly degraded only by divalent cation-dependent matrix metalloproteinses (MMPs). Not surprisingly, experimental evidence supports a critical role of MMPs, such as MMP-2 and MMP-9, in the invasion and metastasis of breast cancer . MMP-13, also named collagenase-3, is another MMP that is implicated in the degradation of ECM [5, 6]. Recent studies further suggest that MMP-13 may play a central role in the extracellular MMP activation cascade [7, 8]. It has been reported that overexpression of MMP-13 in several types of malignancy [9–17] is associated with shorter overall patient survival [16, 18, 19]. Consistently, functional evidence demonstrates that MMP-13 increases the invasive capacities of the malignant cells [20–24]. However, the clinical utility of MMP-13 as a breast cancer marker remains controversial. While several studies conclude that MMP-13 is produced by tumor stromal fibroblast-like cells , others claim that MMP-13 is synthesized predominantly by tumor cells . For example, Balduyck, et al, demonstrated that MMP-13 was expressed in more invasive breast carcinoma cells . Nielsen and colleagues showed that MMP-13 was expressed in myofibroblasts [25, 26]. The goal of current study was to evaluate the prognostic value of MMP-13 expression level and its tissue distribution pattern in a large cohort of human breast cancer patients. Our evidence demonstrates that increased tumor-derived MMP-13 expression independently predicts poor prognoses. Furthermore, the combination of MMP-3 with other clinicopathological parameters and/or other breast cancer biomarkers may be particularly useful. The cohort includes a total of 263 cases of invasive breast cancer, diagnosed and surgically treated between January and December 1993 at the Department of Breast Cancer, Tianjin Medical University Cancer Institute and Hospital . Patients had not received prior radiotherapy or neoadjuvant therapies. All patients received conventional postoperative treatment, depending on the extent of the disease. Patients without axillary lymph node involvement were treated with surgery alone, while patients with axillary lymph node involvement received six courses of adjuvant chemotherapy with cyclophosphamide/methotrexate/fluorouracil regimen. Patients with positive nodes or tumor size ≥ 5 cm received postoperative radiation. The patients with ER+/PR+ tumor were treated for 2–5 years with tamoxifen. The patient characteristics including age (median: 50.3 years), menopausal status, clinical stage (TNM classification defined by the International Union against Cancer, UICC, 2003) were assessed by the surgical pathologists. These data as well as the postoperative follow-up information including local (regional) recurrence and overall survival have been previously described . Briefly, among the 263 cases, 132 women were premenopausal, while 131 were postmenopausal. At the time of surgery, 68 cases (25.9%) were Grade I tumors, 119 (45.25%) cases were grade II tumors, and 76 cases (28.90%) were grade III tumors. We used the commonly used grading standard to assign the scores of histological grades of breast cancer. Briefly, the tumor grading combines nuclear grade, tubule formation and mitotic rate. Grade I is assigned to well-differentiated tumors. Grade II is assigned to moderately differentiated tumors. Grade III is assigned to poorly differentiated tumors. Among the 263 cases, 45 cases (17.1%) were classified of T1, 154 cases (58.6%) were T2, 59 cases (22.4%) were T3 and 5 (1.9%) cases were T4. A total of 128 cases (48.%) were lymph node negative, 57 cases (21.7%) were N1, 26 cases (9.9%) were N2, and 52 case (19.8%) were N3. Local recurrence happened in 8 cases (3%). Metastases were identified in 54 cases (20.5%), including 13 cases to the liver, 12 cases to the bone, 11 cases to the lung, 7 cases to ipsilateral or the contralateral suprascapular lymph nodes, 5 cases to the contralateral breast, 2 cases to the brain, 2 cases to the ovary, 1 case to the pericardium, and 1 case to the pleura. All patients, unless deceased, were followed up for at least 36 months, up to 173 months. The cases lost for follow-up (due to patients' death or other reasons) had been marked as censored data. Patient outcome was defined by the months of post surgery overall survival (OS). This study was performed under a protocol approved by the Tianjin Medical University Administrative Panel on Human Subjects in Medical Research and the Institutional Review Boards of Tianjin Cancer Research institution. TMA were constructed with a Beecher Instrument Tissue Array (Beecher Instruments, Silver Spring, MD) as previously described . Briefly, archival paraffin blocks of invasive breast cancer cases were employed. The recipient blocks were cut into tissue cores of 0.6 mm in diameter. Two cores of each specimen, representing the tumor areas, were transferred to the donor blocks. Consecutive 4 μm-thick sections were cut from the recipient blocks to a poly-L-lysine-coated slide for IHC analysis. IHC was performed using a method described previously . A modification of antigen retrieval (5 min high-power microwave followed by 10 min low-power microwave in phosphate-buffered saline (PBS, PH 7.0) was made to detect MMP-2, MMP-9, MMP-13, TIMP-1 and TIMP-2. The antibodies and the dilution factors were as follows: MMP-13 (1: 150 diluted Clone VIIIA2 from Lab Vision Corp.), ER (1:450 diluted clone ID5 from DAKO), PR (1:200 diluted clone IA6 from DAKO); Her2/neu (1:1000 diluted polyconal from DAKO), MMP-2 (1:150 diluted polyclonal from Lab Vision Corp), MMP-9 (1:150 diluted polyclonal from Lab Vision Corp), TIMP-1 (1:150 diluted polyclonal from Lab Vision Corp), and TIMP-2 (1:150 diluted polyclonal from Lab Vision Corp). Human placenta tissues known to express high levels of MMP-2, MMP-9 TIMP-1 and TIMP-2 [28, 29] were used as positive controls for these proteins,. Breast cancer cell lines MCF-7 and T47D were used as positive control for ER and PR, respectively. Ovarian cancer cell line SK-OV-3 was used as a positive control for Her-2/neu staining . PBS was used in the place of the primary antibodies in all negative controls of IHC. IHC was scored independently using a semi-quantitative scoring system as described below by two pathologists (WC and YL), who were both blinded to patients' clinicopathologic parameters and outcomes. Discordant scores were re-evaluated by the investigators and the consensus scores were used for further analyses. Both the intensity and extent of IHC were assessed . The intensity of the immunostaining was defined by the negative and positive controls as four categories. No brown particle staining: 0; light brown particle in cytoplasm: 1; moderate brown particle: 2; and 3: dark brown particle. The percentage of positive cells, as the extent of immunostaining, was quantified under microscope and classified into four groups. 1: <25% positive cells; 2: 25% to 50% positive cells; 3, 51% to 75% positive cells and 4, >75% positive cells. The staining index (SI), the product of the intensity and the percentage of positive staining, was used to define high (SI ≥ 6) or low (SI < 6) expression of MMP-13, MMP-2, MMP-9, TIMP-1 and TIMP-2. The criterion of Herceptest/Pathway system was followed to score Her-2/neu Briefly, cases with strong complete membranous staining in more than 10% of the tumor cells were considered strongly positive (+3). Cases with weak to moderate complete membranous staining in more than 10% of the tumor cells were considered moderately positive (+2) and were subsequently confirmed by fluorescence in situ hybridization. Cases with little or no membranous staining were considered negative (0 or +1) . The criteria for scoring of ER and PR are similar. Cases with strong/moderate complete nuclear staining in more than 15% of the tumor cells were considered positive, whereas cases with little or no nuclear staining were considered negative [27, 31]. Statistical analyses were performed using the SPSS software package 11.0 (SPSS, Inc. Chicago, IL, USA). The correlations between MMP-13 expression and clinicopathologic variables were analyzed using Pearson Chi-square analysis. The same method was used to test the associations of MMP-13 with ER, PR, and Her-2/neu, respectively. Kaplan-Meier curves were constructed for univariate and multivariate analyses using a Cox proportional hazards model to examine the potential prognostic variables on OS. No corrections for multiple comparisons were made. All of the statistical tests were two-sided. p values of less than 0.05 were considered statistically significant. Distinct IHC staining of MMP-13 was obtained from all 263 cases. The tumor or fibroblast-specific staining was semi-quantitatively scored by the SI scales and assigned into high and low categories. As shown in Figure 1, MMP-13 protein expression was detected mainly in cytoplasm of in malignant cells and the peritumoral fibroblasts in 127 (48.29%) and 144 (54.75%) cases, respectively. One hundred and eleven out of 127 specimens with high levels of tumor expression of MMP-13 (87.40%) featured high levels of MMP-13 in peritumoral fibroblasts. Consistently, 106 out of 144 specimens with low levels of tumor expression of MMP-13 were accompanied by peritumoral fibroblasts that expressed MMP-13 at low levels (Table 1). Overall, the detection of cytoplasmic MMP-13 in tumor cells, correlated significantly with the cytoplasmic MMP-3 in the peritumoral fibroblasts (p < 0.0001). Low: immunostaining SI < 6; High immunostaining SI ≥ 6; n: number of the cases. Differential expression of MMP-13 in breast cancer and peritumoral fibroblast cells. 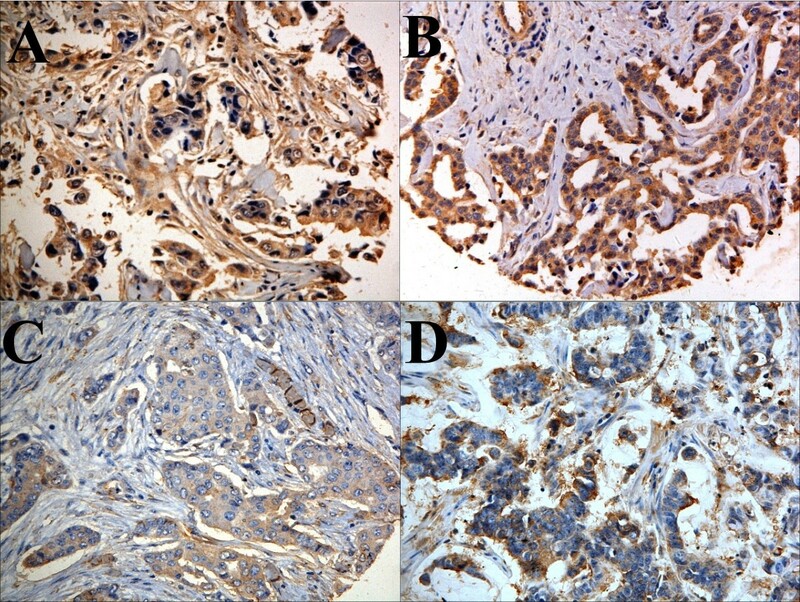 Invasive ductal carcinoma featured MMP-13 protein in the cytoplasm of both the cancer cells and peritumoral fibroblast cells (A). High levels of MMP-13 protein exclusively in the cytoplasm of the cancer cells (B). The brown color represents the IHC staining of MMP-13. The blue color represents the nuclear counterstain. × 400. Insets of A and B show a section of the each field with higher magnification. × 1000. In order to test the potential value of MMP-13 as a breast cancer biomarker, we performed Pearson Chi-square analysis to evaluate the correlation of MMP-13 expression with clinical and histopathological features (tumor size, tumor grade, and lymph node status) that are further stratified as shown in Table 2. p values of less than 0.05 was considered statistically significant. High levels of MMP-13 expression, both in cancer cells and in peritumoral fibroblasts, correlated with lymph node metastases (p < 0.001), but not with tumor size and histological grade. MMP-13 did not appear to be regulated by sexual steroid hormones, since it was not correlated with the menopausal status of the patients. Nor was it correlated with ER or PR. Interestingly, a strong correlation between MMP-13 and Her-2/neu nuclear staining was observed both in cancer cells (p = 0.015) and peritumoral fibroblasts (p < 0.001). Biochemically redundant members of the MMP family may have intricate interactions in tumor progression. Withj the aim to understand the relative significance of MMP-13, we examined its correlation with other MMPs (MMP-2 and MMP-9) and tissue inhibitors of MMP (TIMP-1 and TIMP-2). Distinct IHC staining of each of these proteins were detected in the cytoplasm of both the cancer cells and adjacent fibroblasts (Figure 2). MMP-13 detected either in cancer cells or in adjacent fibroblasts, was not correlated with MMP-2 or MMP-9 (Table 2). Thus, the differential expression of MMP-13 in breast tumor progression may be regulated by a mechanism different from those for MMP-2 and MMP-9. High levels of MMP-13 in both cancer cells (p < 0.010) and peritumoral fibroblasts (p = 0.002), significantly correlated with the levels of TIMP-1 protein in the same specimens. In addition, MMP-13 in peritumoral fibroblasts correlated to lesser extent, albeit significant, with the levels of TIMP-2 protein (p = 0.029). Representative IHC of an infiltrating ductal carcinoma TMA. (A): MMP-2; (B): MMP-9; (C): TIMP-1; and (D): TIMP-2. The brown staining represents the indicated antigen, while blue color is the counterstain of the nuclei. ×400. The mean follow-up of the 263 patients in our cohort is 92.1 months. Kaplan-Meier analyses showed a clear stratification of the overall survival (OS) between the patients with high levels of MMP-13 expression and the patients with low levels of MMP-13 expression (Table 3). High levels of MMP-13 expression both in the cancer cells (p = 0.0008) and the neighboring fibroblasts (p = 0.0001) negatively correlated with OS (Figure 3A and 3B). Tumor expression of MMP-13 negatively correlated with patients' OS regardless of the Her-2/neu status. It was noted that MMP-13 detected in peritumoral fibroblasts correlated with the OS of the lymph node positive subgroup (p = 0.047) and with the Her-2/neu negative subgroups (p = 0.045) (Figure 3C–F). When the patients' survival was stratified by lymph node status, MMP-13 expression was negatively correlated with the OS of the lymph node positive subgroups (p = 0.0041), but not with the OS of the lymph node negative subgroups (p = 0.344). In the Cox regression model, univariate survival analyses showed that tumor size, lymph node positivity (>N2), PR, Her-2/neu, TIMP-1 and MMP-13 were each associated with worse prognoses, while, multivariate survival analyses showed that lymph node positivity (>N2), tumor size, Her-2/neu, MMP-13 and TIMP-1 expression by cancer cells were independent adverse prognostic factors for overall survival (Table 4). Parallel analyses showed that ER and Tumor Grades were not correlated with OS. Correlation of MMP-13 expression with OS of overall and stratified subpopulations. OS: Months of overall survival; n: Number of patients; E: Events of positive stains; CI: confidence interval. HR: Hazard Risk in Cox proportional hazard model analysis. HR > 1.0 means positive correlation with risk. HR < 1.0 means negative correlation with risk. The prognostic significance of high MMP-13 protein expression in the entire patient population. 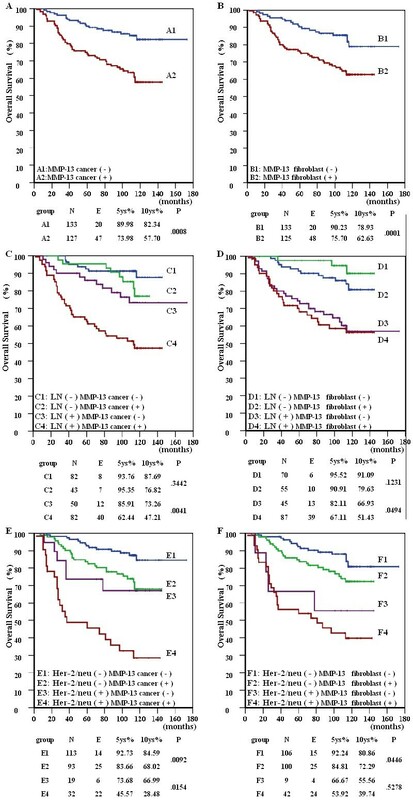 The graphs show the effect of MMP-13 expression within cancer cells (A) and within peritumoral fibroblast cells (B) on patient overall survival (Log-rank test) and stratified analysis by lymph nodes status (C &D) and Her-2/neu status (E &F). Both high MMP-13 expression in cancer cells (A) and fibroblasts (B) associated with decreased overall survival (p = 0.0008 and 0.0001, respectively). When patients' OS were stratified by lymph node status and Her-2/neu status, MMP-13 expression in cancer cells was associated with reduced OS in the Her-2/neu positive and negative (E, p = 0.0092 and p = 0.0154, respectively) and lymph node positive subgroups (D, p = 0.0041). However, MMP-13 expressed within fibroblasts only weakly affected OS of lymph node positive (D) and Her-2/neu negative subgroups (F, p = 0.04694 and 0.04461, respectively). Predicting patients' prognoses is clearly one the most challenging issues in breast cancer management. Racial, geographical and dietary factors have all been considered for their impact on breast cancer incidence and survival. However, at the histopathological level, breast cancer is a highly heterogeneous disease, hampering prognosis prediction. Histological grading, as shown by others and data in this paper, is not a reliable prognostic predictor. Hormone receptors (ER and PR) and Her-2/neu have been used as biomarkers with certain degree of success. In the current study, we examined a cohort of 263 Chinese breast cancer specimens and report that MMP-13 correlated with more aggressive breast cancer. Our data suggest that MMP13 may serve as a marker for poor prognosis. To our knowledge, this is the first IHC study to investigate the potential utility of MMP-13 as a biomarker of breast cancer among Chinese patients. Our data support the earlier notion that MMP-13 marks the transition of ductal carcinoma in situ to invasive carcinoma  and increases the invasiveness of breast cancer cells in vitro . The biological activity of MMP-13 in tumor progression may not be limited to breast cancer. For instance, Culhaci N et al., showed a significant correlation of MMP-13 with the aggressiveness of head and neck squamous carcinomas . Although tumor cells pass through multiple tissue barriers to metastasize, increasing evidence demonstrates a critical role of stromal cells in tumor microenvironments [32, 33]. Vizoso FJ noted that MMP-13 in fibroblastic cells and mononuclear immune cells was associated with increased risk of metastases . Interestingly, others have reported that MMP-13 protein was restricted to small stromal foci within the tumor masses and was specifically produced by invading tumor cells . In this study, we found MMP-13 protein in the cytoplasm of both cancer cells and tumor-adjacent fibroblasts. The expression of MMP-13 in cancer cells correlates with the MMP-13 expression in the peritumoral fibroblasts. Furthermore, high levels of MMP-13 in cancer/peritumoral fibroblast cells correlate with tumor infiltration of lymph nodes. While this finding suggests that MMP-13 is likely to play a role in promoting tumor invasion and metastasis, further studies are needed to clarify whether the MMP-13 protein was expressed by both cancer cells and fibroblasts or by tumor cells alone. The two types of most widely accepted prognostic biomarkers for breast cancer are hormone receptor (ER and/or PR) and oncoprotein Her-2/neu. ER is used to predict not only the response to endocrine therapy but also better overall survival. In contrast, Her-2/neu predicts more aggressive tumor phenotype, poor disease-free survival and poor OS [26, 27]. High levels of MMP-13 in cancer cells correlated with the expression of the Her-2/neu protein. Recently, Ocharoenrat et al. reported similar results in head and neck squamous cell carcinoma specimens . Currently, it is not known whether MMP-13 is regulated by Her-2/neu. To this end, it is important to note that MMP-13 seems to be of prognostic value even for the Her-2/neu positive subset of cases, suggesting a Her-2/neu-indepdent function of MMP-13 in promoting breast cancer progression. The correlation of MMP-13 with poor OS and tumor infiltration of lymph nodes suggests that it may promote tumor invasion. Since MMP-13 is a metalloproteinase, it may act in a similar manner as other MMPs, such as MMP-2, MMP-9. In fact, both MMP-2 and MMP-9 have been extensively studied as biomakers and as well as therapeutic targets in breast cancer [36–39]. Interestingly, MMP-13 in both cancer cells and peritumoral fibroblast cells showed no correlation with either MMP-2 or MMP-9. Instead, we noted that MMP-13, both in cancer cells and peritumoral fibroblast cells, correlated with TIMP-1 and TIMP-2 (to a lesser extent). Thus, MMP-13 may be independent of MMP-2 and MMP-9 as a marker and as a regulator of breast tumor progression. The intricate interactions between MMPs and TIMPs are likely to be complex. Indeed, in contrast to the initial simple biochemistry-based hypothesis, TIMP-1 is viewed as a promising marker to predict poor prognoses of human breast cancer [40–42]. The recent discovery of proteolysis-independent biological functions of TIMPs, such as the growth-stimulating, anti-apoptotic and pro-angiogenic properties, provided new insights into this paradox [40–42]. Further studies are needed to clarify whether MMP-13 and TIMPs act as cognate partners or independently. This IHC study of TMA with 263 specimens of Chinese breast cancer provided the first evidence that MMP-13 is highly expressed by both the tumor cells and adjacent fibroblast cells. High levels of MMP-13 in these two tissue compartments were strongly correlated with each other, and further correlated with Her-2/neu, TIMP-1, lymph node metastasis and decreased overall survival. Our study suggests a potential application of MMP-13 as an independent biomarker for breast cancer prognosis. Bin Zhang, Xuchen Cao contributed equally to this work. This study was supported by the Tianjin Medical University Cancer Institute and Hospital (TJMUCIH) Research Fund and the Tianjin Public Health Bureau (TJPHB) Research Fund. ZB, CXC and ZF participated in the design of the study, optimized and carried out the immunohistochemical staining, performed the statistical analysis and drafted the manuscript. LHT and NLS collected the human tissue. LYX and CWF evaluated the results of immunohistochemical staining. ZSW and SBC prepared tumor tissue arrays block. FL and NY classified the invasive carcinomas. HXS and NRF participated in the design and the coordination of the study. All authors read and approved the final manuscript.